DJ Neil Armstrong DL Feel It Coming MJ X The Weeknd Remix A few weeks ago I was messing around and came up with this remix. I Posted up the practice session on Facebook Live. Some folks asked me to record it for real. Here it is . I think unfortunately there is a divide in urban music between the old and the new. This remix is an attempt to bridge that gap . The weeknd meets Michael Jackson on this remix of "Feel it Coming" w/ "Human Nature". Folks often say that the weeknd "sounds like" the <a href="http://uproxx.com/music/the-weeknd-i-feel-it-coming-michael-jackson/">king of pop</a>. Some might take that as a slight... I think comparing and sounding like MJ is a compliment and a half. 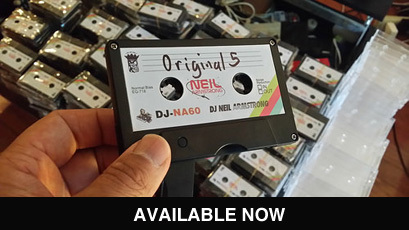 Hope you enjoy this, feel free to share with your friends and let em know about <b>your friendly neighborhood Mixtape DJ - DJ Neil Armstrong</b>. A few weeks ago I was messing around and came up with this remix. I Posted up the practice session on Facebook Live. Some folks asked me to record it for real. Here it is . I think unfortunately there is a divide in urban music between the old and the new. This remix is an attempt to bridge that gap . The weeknd meets Michael Jackson on this remix of "Feel it Coming" w/ "Human Nature". Folks often say that the weeknd "sounds like" the king of pop. Some might take that as a slight... I think comparing and sounding like MJ is a compliment and a half. Hope you enjoy this, feel free to share with your friends and let em know about your friendly neighborhood Mixtape DJ - DJ Neil Armstrong. Possibly one day this remix will end up on a mixtape of mine. In the meantime, enjoy it for Free here. I think unfortunately there is a divide in urban music between the old and the new. This remix is an attempt to bridge that gap . The weeknd meets Michael Jackson on this remix of "Feel it Coming" w/ "Human Nature". Folks often say that the weeknd "sounds like" the king of pop. Some might take that as a slight... I think comparing and sounding like MJ is a compliment and a half. Hope you enjoy this, feel free to share with your friends and let em know about your friendly neighborhood Mixtape DJ - DJ Neil Armstrong.